Thank you guys for your help and for your posts that lead me to build this! 2nd monitor (the one using HDMI) runs in 30fps for any resolution - Fix: switched GPU and now using display ports for both monitors, works like a charm! Thank you for sharing your implementation. Scratch the comment about [email protected] requiring 15Gbps. If your 4K LCD is attached to the eGPU then there is no impingement on your 10Gbps-TB1 link. Any idea why/how to fix it? The HDMI cable should be 2.0 compliant: https://www.amazon.co.uk/dp/B00Z9X0USK Thanks! Glad to hear this worked out for you. Sorry to hear about the HDMI2.0 crap. I guess you'll need to find a GTX970 with two DisplayPort connectors...At least you ordered from Amazon, so the return and exchange shouldn't be too hard! Here is a different GTX970 option that comes to mind. (Price was for a used one). 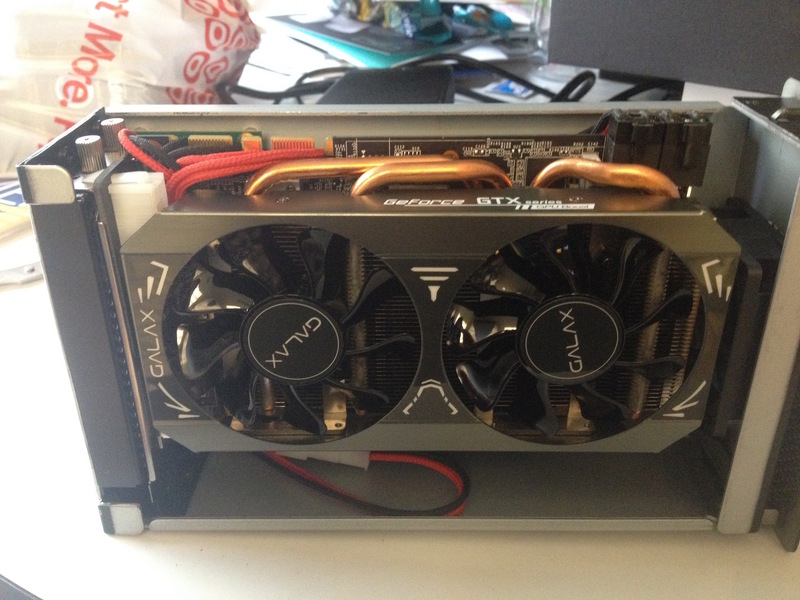 The new GTX 970 from MSI arrived and plugged in. Now both monitors work at 60Hz . YAY! I sensed a bottleneck on the CPU side so I will try the eGPU with a 2015 15" MacBook Pro with i7 quad @ 2.2 running El Capitan. Will publish the results on the new thread. Tested the eGPU on a MBP 15" 2015 with quad core 2.2GHz and thunderbolt 2. Results below. My new machine arrived today. Late 2-16 13" MBP i7 dual core @ 3.3. Updated first post with pictures and new benchmark. But a new issue popped. The Mac give a black screen (it needs to be reseted) if it goes into sleep. Anyone encountered this? P.S. @nando4 can you change the name of the thread/implementation to reflect the new machine and thunderbolt port? I always see pictures of people proudly showing their open laptop sitting next to their display(s)... what happens if you close the lid? Can you put the computer off to the side (or in a nice laptop stand) and only use the external display(s)? Ha, never tried. I actually like it open. There is a software named InsomniaX that could help. Right now my eGPU is spread out since I am rewiring it, but tomorrow or the day after tomorrow when I will finish it, will definitely try and let you know! Don't use your MacBook closed you will finish with a display failure! 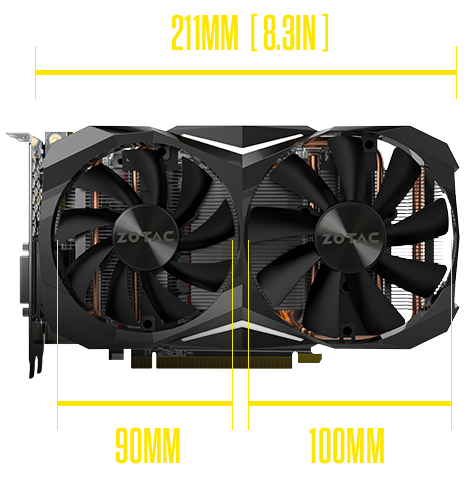 Also in future you can use ZOTAC GeForce GTX 1080 Mini, i also have the idea to make custom Akitio Thunder3 case with GTX 1080 Mini (Power Consumption 180W and will work with DA-2 220W) in future but i will wait for next-gen Macbook Pro 15' first! I started another project with a TB3 enclosure, will open a thread once I have all the components in place. Meanwhile I am working on making this setup pretty and also ordered another GPU from Amazon. A 980. Will see which one will be the winner. After returning the one I consider the worse (bear in mind that I am not a benchmark fanatic; I judge the GPUs from other perspective also: heat, noise, beauty, WOW factor, etc) I will order a RX 980 and choose again. It's great that you mod like me the Akitio Thunder2 Case - its the best part for me of the eGPU Setup. I will follow your thread. I will use an 120W power source and feed power through the barrel plug. As at what I am using my eGPU... It is used mainly to feed 2 4k monitors while working and doing some minor gaming (EVE Online, D3, etc). So GPU is not that important there. I do enjoy modding and building things and most of all finishing all my projects. I also ordered a Dremel kit, a glue gun, a heat gun, modding mesh and other minor things needed to work with. Here is the thread about modding the cables. Hopefully will finish all tomorrow. 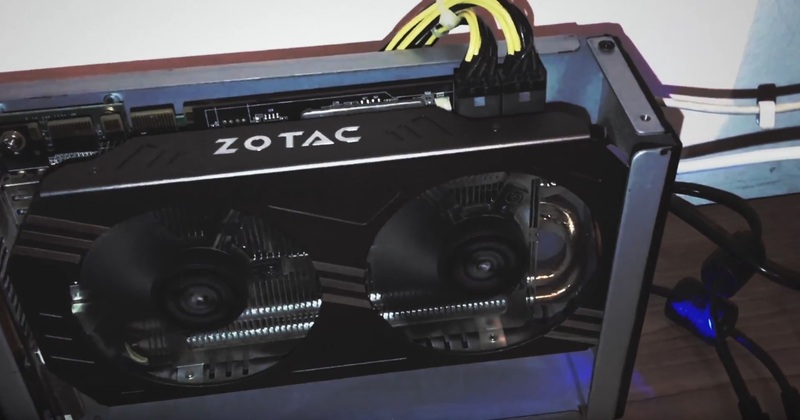 Later edit: watched the video, it looks like the 970 is a bit tall do you know if you can close the enclosure using low profile connectors? But is larger for sure, he removed the fan and the front of the Akitio! You can cut the Front of the Video Card to install the front of the Akitio but you will loose the warranty! I'm curious why you say this? I understand it'll be problematic if you close the lid and allow the laptop to go to sleep. Is this what you're referring to? Because Sleep on lid close can be disabled with InsomniaX. Mehenn, if you have a chance could you try this for those of us wondering? Not many people have a setup around these parts going yet (money, probably) and would love to know to better inform for future purchases. I'm thinking once everything is up and running, use InsomniaX -> Disable lid sleep -> lower brightness on internal screen until it's black -> close lid. I won't *always* be using my eGPU that I'm planning on getting, but for when I do I need it to sit in my vertical dock slot, so if this workaround works and I can get the laptop closed before inserting into the dock, I'll be the happiest camper in the milky way. Hi what pci power connected did it have? 8 pin? P.S. updated the main post with the new GPU and benchmarks. Wait wait wait! I missed this: you are able to run GTX 980 with Dell Da-2???? It actually uses 225W. The Dell DA-2 delivers 220W. 10 is used by the enclosure, that remains 210W. Under very heavy heavy load I've seen signs of under power (black squares, comet trails while dragging windows, etc) but it was very stable and silent. 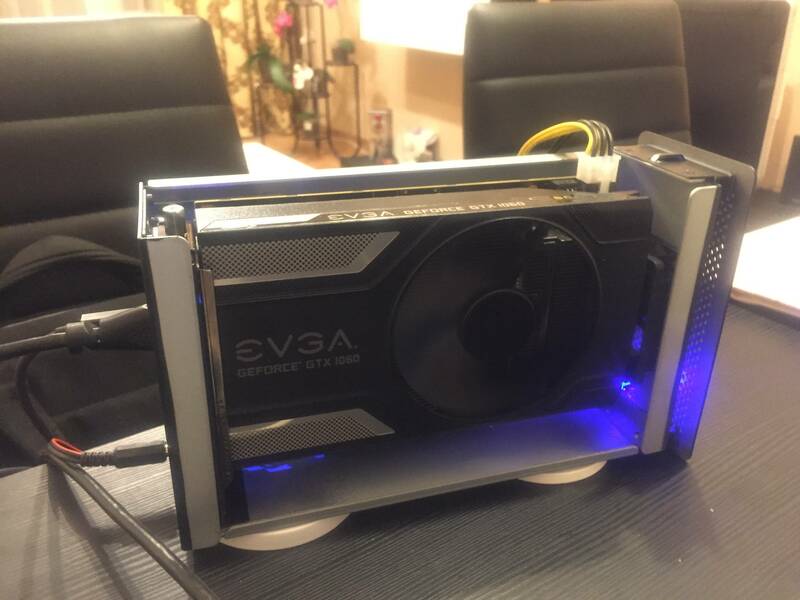 While it's possible to run the GTX 980 with an DA-2 power brick, I'd recommend using a more powerful PSU. I've ran into hard crashes using the DA-2 with GPU rated 150W or more. At least my MSI GTX970 Gaming 4Gb OC hasn't crashed yet while doing some editing in FCPX, gaming Counter strike with max settings or running heaven, valley and Luxmark benchmarks. I don't know if those qualify as heavy load 🙂 What I find a bit funny is that GTX970 is not able to run 4k videos in quicktime without stuttering, but 3840x1600 plays still just fine. Maybe that is just a driver issue. Intel Iris 540 plays 4k without an effort. Pairing the GTX 970 with DA-2 should be fine. Which Thunderbolt 3/2 adapter did you use? Works with windows??? I've had to underclock and underpower my Zotac GTX 970 slightly (90% power, -75 mhz core) to make it stable enough not to trip the circuit protection on the DA-2. It was mostly stable at 100% power and stock clocks but sudden explosions (intense graphical effects) onscreen would shut down the DA-2 and crash the drivers. I suspect this was an overvoltage problem when the card needed to quickly ramp up the boost clock. (See the discussion of DA-2 power draw in the power subforum.) Slightly underclocking it keeps the clock steady at ~1200 mhz, with no boost and hence no overvoltage. YMMV depending on the particular power target and limit set by the vbios in specific cards, but anything >150W could potentially run into this problem with the DA-2.